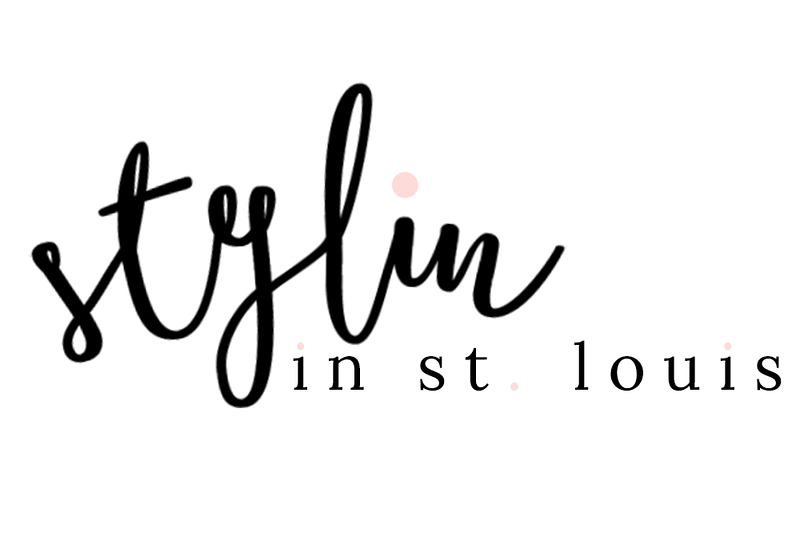 Stylin in St. Louis: Spotlight of the Week: Chambray…. Spotlight of the Week: Chambray…. Happy Thursday! This week Ell and I styling chambray! Chambray has become a staple item in my closet! It is so easy to wear and goes with everything! I love how versatile it can be! 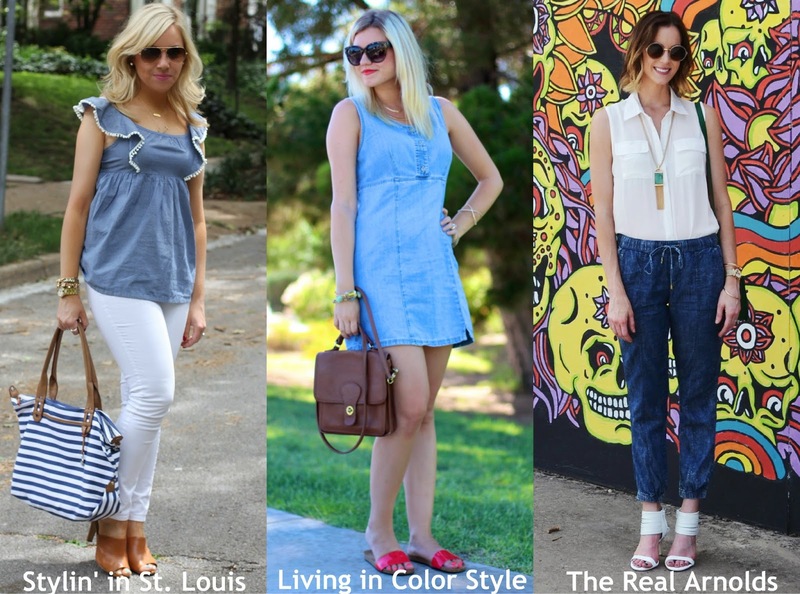 Come share your chambray looks with Elle and I! Spotlight: Our spotlight of the week is Jaime of Regally Soled blog! Jaime knows how to rock summer pastels with her sherbet striped shorts! Such a great look for summer! Be sure to check out her blog! Next week: Next week our spotlight weekly theme is summer prints/patterns! Thanks for linking up! See you next week! This chambray top is so pretty and unique! I love it paired with you white denim. 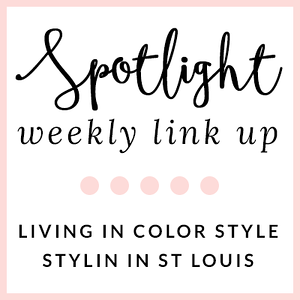 Thanks so much for hosting the link up! Love that top! Such a girly spin in chambray! Chambray and white look so great together! Such a cute outfit and you look beautiful as always! You look too cute!! In love with that top! The pom poms and chambray combo is perfect! hey! beautiful look! love the top! so cute! your top is so cute, love it! Love the chambray top! It's adorable!! What a very cute chambray top.....love the adorable details!!! I'm a huge chambray fan- I have about 12 chambray shirts, and yet I keep buying more. Maybe I have a chambray problem? :) You look so cute, babe! I cannot imagine combining this outfit any better! The chambray top is so unique. I love it with the white jeans and am now on the hunt for similar shoes. Love the entire look! that bag is so cute for summer! I love your J necklace!! SO cute! I love this look! I need a summer version of chambray like this! You look great! Such an adorable top! Love it! Hope you are having an amazing vacay! This top is so pretty with the ruffle detail. Great summer outfit with the white pants & brown accents. SUCH a cute top-- love it with the white jeans! Can't get enough chambray this summer-- currently on the hunt for a good shirtdress or romper in it! I really like your outfit! I see that top all over the instagram world and it is so cute! Such a cute top! Chambray just never gets old. Love this post on chambray. It is something I have always liked but don’t have a lot of- I need to fix that!